International Day of Peace is held every year on September 21st. It was instigated by the United Nations. There are many churches and organisations of other faiths that take this opportunity to pray for peace. Events all around the world are listed here. Tune In / Online Resource Peace In Our Time (Dave Brown) Groovy song seeking peace for all. Lyrics, sound sample, free downloadable songbook. FFS09 Christ of the sad face (Shirley Murray) Christ weeps for the city, the earth. A longing for peace. FFS42 Let there be peace and love (Cecily Sheehy) This is for the those in Aotearoa / NZ (or those who would like to sing in Māori as well as English. A simple song. Good for kids. Iona (Sent By The Lord) / CH275 / VU34 / ELW247 / A&M029 / SFFS 2232 / GtG103 / CP588 / W&R157 / SP10 / URW415 / STB241 Come now O Prince of peace / O-So-So (Lee) A lovely simple and gentle song, inclusive for God and people. One of very few songs from Asia in Western hymnals. *AoV2-040 In Labor All Creation Groans (Delores Dufner) Excellent words of creation's longing for peace and an end to violence; includes a voice that is particularly focused on violence against women. Lyrics and sheet music. Lovely sound sample. New words to old tunes. FFS65 / SFFS 2185 This thread I weave / For one great peace (Shirley Erena Murray) Lovely simple song about how all our actions can be part of a prayer for peace. NCYC09 For my brother I pray peace / Understanding through you Lord (Price) Excellent song for intercessions. Not easy the first time through, but catchy once you know it. Needs quite a good vocal range, and a good keyboardist or (better) a guitarist because it's written in a fairly tricky key. GC(II)722 / G(3)826 Jesus give us your peace (Mahler) Gospel song. It kind of merges personal peace with global peace. "Jesus bring us your peace, bring us together, let all the fighting cease…" Good for kids and teenagers. Lyrics and sheet music. Sound sample. SP&P122 Pray pray pray for peace within our world (Nix) A simple prayer for peace. A good centering prayer. 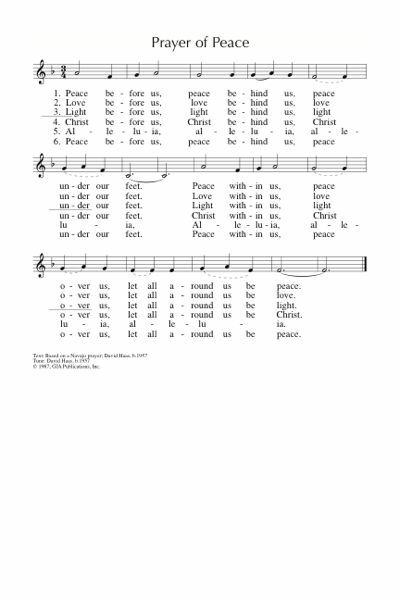 Online Resource Peace, Salaam, Shalom (Pat Humphries) A beautiful and simple chant with two cantor lines over the top. 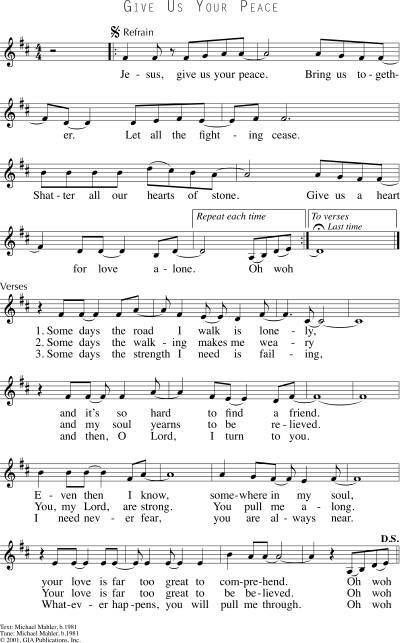 The congregation could easily sing the basic round even without the cantor lines as a meditative focus. Free sheet music. Recorded Music Salaam (Sheva) (an awesome world-folk-rock Israeli-Palestininan group). Their song, Salaam, couples Jewish and Muslim prayers for peace. It was also arranged for a cappella choir by the late Melanie Shanahan, and has been recorded by Living out Loud. AoV1-091 / AoVK-68 / StS016 / G(II)527 / GC(II)720 / G(3)821 Peace before us peace behind us (David Haas) I love this one. Reflective. Careful not too get too schmaltzy because it's long. Less is more. It's good to do something while singing this song. I did a circle dance at church to this once upon a time, but I can't remember how it went. It works well at a walking pace. Schmaltzy and SLOW sound sample. Lead sheet. Good for kids. Tune In / Online Resource All will finish well (Dave Brown) "You, in all our worries, you offer peace... In this world where injustice reigns, you are in the midst of pain”. Lyrics and sound sample and downloadable songbook. AoV1-190 / UMH431 / HPP308 / G(II)529 / GC731 / GC(II)723 / G(3)829 / W&R614 / Cha677 / G(3)829 Let There Be Peace on Earth and let it begin with me (Miller/Jackson) Well known, and great for older kids. AoV changes "Brothers all are we, let me walk with my brother" to "We are family. Let us walk with each other". Good for kids. Lyrics. AoV1-106 / UMH376 / WoV774 / ELW753 / GtG752 / G(II)528 / GC730 / GC(II)724 / G(3)822 / CP562 / Cha297 / URW443 / 82Hml-712 / Lau904 Dona Nobis Pacem (American folk song) This is very well known, and would fit well with this reading. Good for kids.Oldy-but-a-goody. *CH527 / A&M717 / SP290 / 82Hml-593 Lord make us servants of your peace (Quinn) A nice alternative to "make me a channel of your peace". This is sung to the very familiar tune "O Waly Waly". It is also sung in the plural (us and we rather than Me and I), which is nice too. Lyrics can be found here. New words to old tunes. CH786 May the God of peace go with us (Jamieson) A lovely benediction to a traditional Scottish tune. "May the God of peace go with us as we travel from this place; may the love of Jesus keep us firm in hope and full of grace". *UMH729 / VU682 / LBW161 / WoV762 / ELW627 / GtG373 / PH450 / CP573 / W&R539 / Cha711 / URW140 / 82Hml-597 O day of peace that dimly shines (Carl P Daw) A song of hoped-for peace. The tune in Chalice hymnal is really nice (CANDLER) or O WALY WALY which is used in URW. Other sources use JERUSALEM, which is a bit too militaristic for me. Lyrics and JERUSALEM sheet music. New words to old tunes. MV149 Peace for our children (Lankshear-Smith) A simple and quite repetitive (in a nice way) song that prays for peace for children, women, men, families, nations… and the soul. CP(E) 611 We bring you Lord our prayer and praise (Dudley-Smith) Good, stirring words. GGives2 What does peace look like to you (Mandy Dyson) A really nice simple song for kids about peace. Lots of questions about what peace might mean from images of nature, to an end to war. The last verse talks about a "bridge from God to man" which could be changed to "bridge from God to us". Good for kids. Seeds of Faith Peace Be With You (Richard Bruxvoort-Colligan) A very simple kids song about peace, and sharing peace. Sound sample. Good for kids. MV222 May the peace of God be your peace (McLaren) A lovely benediction. Will need to be taught first. Online Resource I am for peace (Richard Bruxvoort-Colligan) A very simple chant with an excellent contemporary cantor part, based on Psalm 120. This would be really good for a Palm Sunday Peace march (or a peace march at any other time). Great sound sample, and (for now) free sheet music. GtG448 / SP&P204 Peace of God be with you / As-salaamu lakum (Richard Bruxvoort-Colligan) Arabic and English words, very simple to learn and sing. Particularly if you are focusing on peace between countries that speak these languages. STB281 From the unreal lead to the real / Asa toma sathgamaya (Sanskrit Bhajan) This traditional Sanskrit chant could be good to sing - sometimes peace seems too unreal, but we should keep our hope alive.